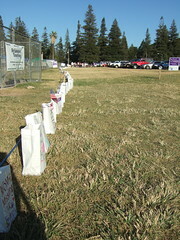 Jeff’s work, Pinnacle Bank, participated in Relay for Life (Gilroy, CA) and raised over $14,000 for the American Cancer Society. We went to the event on Saturday and helped support the cause. Cancer is such a scary illness that affects so many people. 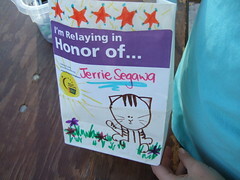 The only Relay I have been to was years and years ago, when my jump rope team was invited to do a show – so I don’t remember much. We decided to go in the late afternoon, which was perfect because the weather wasn’t too hot or cold. I was amazed at how many lanterns where lining the track. Each lantern represented someone who was Relaying in Honor of someone, or in Memory of someone who was affected by cancer. I wanted to dedicate one in honor of my mother, who fought breast cancer a couple of years ago. Thankfully she is doing really well now. My Aunt also had breast cancer approximately a decade ago, and just recently got it again. It is a very real possibility that I may suffer from cancer in the future. 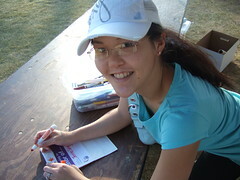 So it is pretty important that I do my part to help support research, prevention, and a cure. 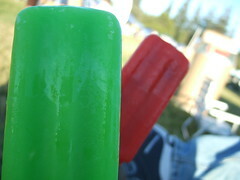 After our walk, we finished the day with some yummy popsicles, which where being sold at Pinnacle Bank’s booth. My aunt had breast cancer twice and is fine now. I’m sure your aunt will be fine too. I hope she is doing well. yeah, like the only time you come to gilroy, ever, and don’t tell me?